I wanted to put together a quick OOTD featuring my two favorite colors black and white. 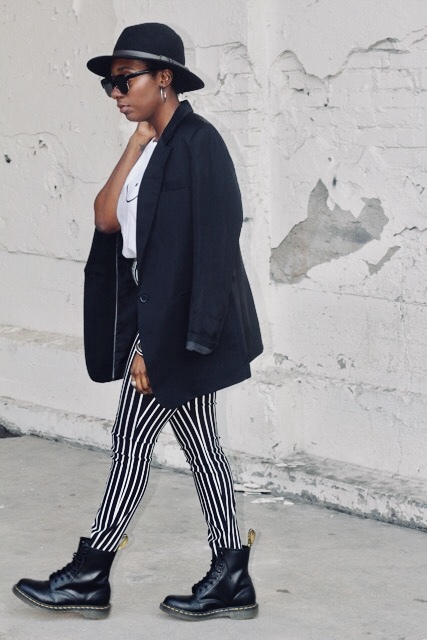 Black and white can sometimes be a little boring but I like to change it up by adding cool prints with these stripe pants that remind me of Beetlejuice. I picked them up from a thrift store which goes to show you can find really great pieces at your local thrift store. I love incorporating fun graphic t-shirts into my wardrobe and when I found this little number that I picked up from Etsy. Of course I had to add a few accessories to really make the outfit more me by adding Dr. Martens, sunglasses and a wide brim hat. I am also really into blazers at the moment and this one I also got from my local thrift store but I do have my eye on one from Everlane. I love this outfit because it shows that black and white can be fun.